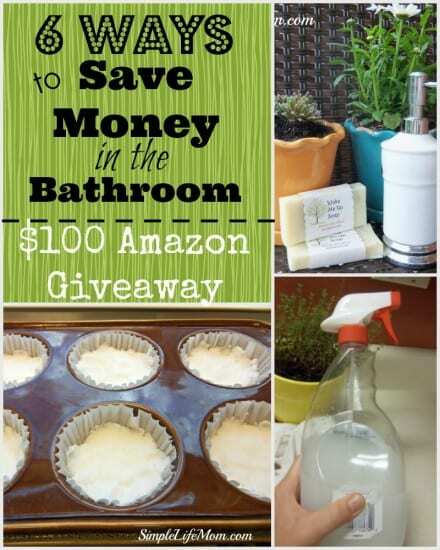 6 Frugal Tips AND a $100 Amazon Gift Card Giveaway! 1. Make Your Own Soap and Shampoo Bars. Check out my SOAP Page for a number of recipes for making your own soap. It is healthier by FAR and is much more frugal than buying your own healthy ingredient soap. The same goes for shampoo. Even more so since shampooing and conditioning with store bought brands is more expensive and trains your scalp to need to be washed daily. You can get recipes HERE and HERE. Read How to Go No ‘Poo and Use Natural Shampoo Successfully. If you’d still like to purchase natural soaps and shampoos with the healthiest ingredients, you can find them in My Shop. 2. Adjust the water level in your toilet’s tank. You can adjust the water level of your toilet’s tank so that you use less water. There’s a little screw to adjust the floater. If you cannot easily adjust the water level in your tank, then place a few filled water bottles, or fill up a used 20 oz bottle with water, and place them in the tank of your toilet. It will take up space and cause your tank to stop filling sooner than it would. Saving you money on every flush. 3. Install a Water Regulating Shower Head. Cutting down on water being flushed won’t do too much if your kids take 20-30 minute showers or run the water the entire time they brush their teeth. Give your kids time limits. We had a timer that we set for them when they were younger to help them get into the habit of taking shorter showers (of course then you have to make sure they’re not just walking around in the water for that entire time, LOL!). A Water Regulating Shower Head, or one that has an on and off switch can come in very handy. I actually love them when I am shaving. I press the button, lather up, shave, and press it again and I don’t have to worry about losing all the soap off my legs before I can finish. You also do not need to worry about water splashing up against glass showers as you can turn it off from the handle. This can make cleaning the glass much easier as there will not be as much scum stuck to it! There are a number of different kinds. Here is one with a shut off switch. 4. Use Septic Safe Toilet Paper. The septic safe toilet paper may be thinner, but it gets the job done just as well. Teach your kids how to fold and use toilet paper so that they are using less. They won’t know how unless you specifically teach them. This is a big saver. Those cleaning wipes, sprays, and other cleaners can get really expensive. It’s easy to make your own toothpaste. Here are 3 Natural Toothpaste Recipes to get you going. Making your own products also cuts down on plastic containers that are thrown away. After all, you’ll be using reusable glass jars or other containers. 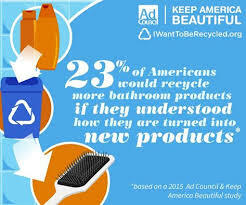 Re-purposing items and recycling those you don’t not make yourself is easy when you place a recycling bin in the bathroom. To celebrate being frugal and earth friendly at the same time, here’s a $100 Amazon Gift Card Giveaway!! Check out the video for a fun bathroom recycling idea and then enter in the giveaway below! Sometimes it is hard to find out where to recycle. Mice article. I agree that making your own cleansers, soaps, shampoos, etc…, is a great life-long with laundry soap, and fabric softener. I mean, $20.00, is what laundry soap cost you to make, and can last about one year. The natural soaps clean just as well, if not better, than commercial products. Why more people are not doing this is beyond me. Keep up the good work, maybe will attempt to do this, when they realize that they can do for 95% less than what they currently spend, and do just as well as store bought, with less chemicals that not only harm environment, but our bodies. Yes, making your own products and cleaners is much much cheaper in the long run and much healthier, so it’s definitely worth looking into if you haven’t yet. Thank you. My daughter was just asking me last night to make her more. She won’t use anything else now. It’s good stuff.